There is no shortage of training devices on the market, but not all are worth your hard-earned money. ACE exercise physiologist Fabio Comana, M.A., M.S., recently evaluated two popular new training tools—Core-Tex and ViPR—to determine if these new products are costly gimmicks or could be valuable additions to your training repertoire. Based on first impressions, the Core-Tex™ may be considered a balance-training device, but after trying it, one realizes it goes beyond balance, stability or even core training. 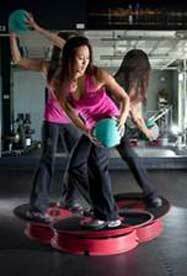 While most balance-training devices strive for improved static stabilization on an unstable surface, the Core-Tex is designed for whole-body dynamic stabilization over its unique platform. This trains additional skills that include reactivity, power and coordination. 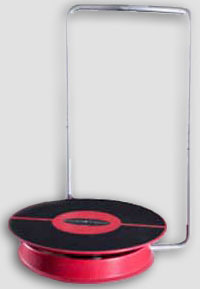 It is this unique characteristic of the Core-Tex that generates simultaneous tri-planar movement and translation that differentiates it from other balance-training devices that either work in all three planes (e.g., wobble boards) or offer translation in one plane (e.g., Indo Board™), but do not combine the two. However, this key feature may also prove to be very challenging, which is why the optional handrail should be utilized for first-time and novice users. Additionally, there are two interchangeable options for the bumpers that hold the platform within the base—the larger bumper creates less motion for new users, while the smaller bumper creates more motion. The accompanying DVD offers multiple exercise options that range from simple to advanced, either with the handrail to assist with single-leg and more advanced movements, or without it by simply lifting the platform off the handrail (without any need for tools or disassembly). With the handrail, the user has full 360° access to the platform for various positions, including standing, sitting, kneeling, quadruped (plus hands-on-floor option), supine, hands-on/feet-on-floor, feet-on/hands-on-floor or a unilateral position with one foot on and one foot off the floor. The Core-Tex weighs 33 pounds, plus an additional 9 pounds for the handrail, making it portable for most. The base and platform are both constructed from durable ABS plastic and features a non-slip rubber surface and bumpers for safety and security. 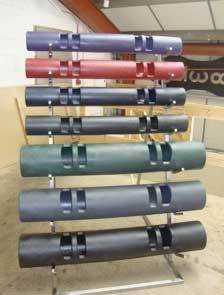 The steel handrail is powder-coated for durability and has a foam-rubber handrail grip for added comfort. The Core-Tex contains three stainless steel ball transfers that can be easily re-positioned within the base to adjust the degree of platform reactivity. In an era where the concept of “functional training” has garnered tremendous attention and popularity, the most effective training tools are those that combine purposeful motion and resistance with functional movement and training. A review of our activities of daily living and the movements performed repeatedly (e.g., putting away groceries, playing with children, working in the yard) makes it clear that those same movement need to be trained under load. Unfortunately, traditional gym equipment and exercises are devoid of this functionality, focusing more upon muscle isolation rather than whole-body integration (or emphasizing one over the other). While muscle-isolation training is sometimes desired or needed within an exercise program, the attainment of true movement efficiency and optimizing health–fitness–performance goals depends largely upon incorporating integrated (whole-body) movement in all three planes of motion (directions). ViPR offers the versatility of accommodating muscle-isolation exercises while offering the freedom to move three-dimensionally during almost any movement pattern (i.e., lift, press, shift or twist) anytime or anywhere. This versatility and the range of available tube weights can meet the needs and training goals of most clients—from the post-rehabilitation client to the performance athlete and the multiple goals of those in between (e.g., toning, weight loss or improved fitness). However, the user must fully understand the scope of its application and design exercise progressions appropriately. It is important to avoid making the mistake of progressing prematurely to heavier tubes before progressing the complexity and efficiency of the movement patterns. Can be used to train multiple parameters of health and fitness, including balance, core, strength, power and anaerobic endurance. Power Balance or Power of Persuasion? All ACE fitness professionals enrolled in the AARP Fitness & Wellness Program will have access to a free personalized marketing toolkit. From flyers and posters to special offer promo cards, we’re helping you market your services to the 50+ population. Already ACE certified, but looking to take your career to the next level? Discover how you can save 46% on your recertification fees, get all the CECs you need for renewal and increase your earning potential and marketability. Sunny Days, 2.0 CECs & $25 in SPRI Bucks! Registration for the 2011 ACE Fitness Symposium is now open. Watch our video with Jessica Matthews to get the latest event details, plus learn how to get $25 in free SPRI equipment and all the CECs you need to recertify, all while basking in sunny San Diego. How would your school spend $25,000 in fitness cash? Orchard Grove Elementary School had the winning essay in this national campaign to reward and encourage physical activity in grade schools. View the winning video and hear from Jonathan Ross and Scott Goudeseune on this inspirational campaign.